GOING TO COLLEGE is part of the American Dream. But today, a college education can be a necessity for people seeking a satisfying career and a living wage. Basic education does not go far enough in meeting workforce demands. Job candidates now are required to possess the skills and knowledge that a college education can provide. Low-income families often find college unaffordable and middle-income families increasingly cite college costs as a deterrent to higher education. Governor Locke believes family income should not be an obstacle to college. In 1999, the Washington’s Promise Scholarship program was established to make the dream of a college education a reality for academically successful high school students. As a result, academic merit, not just financial need, is the leading criteria in a major state financial aid program. Today, Washington’s Promise Scholarships help alleviate the debt burden for middle-income families and make college more affordable for lower-income families by supplementing other financial-aid awards. As Washington’s reforms in K-12 schools get results—improving student achievement—the state also will find a new generation of high school students more capable of succeeding in college. Governor Locke has consistently proposed legislation to make Washington’s Promise Scholarships a permanent program. The Legislature has provided funding for the program in the state budget since 1999, and in 2002, passed a law to permanently adopt it. Establishing and funding Washington’s Promise Scholarship as a permanent program demonstrates a stronger commitment to student learning, sending the message that those who work hard and perform well in school will have financial support in order to attain their dream of a college education. Scholarships can be applied to tuition at public or private colleges and universities in Washington. Students who are eligible are in the top 15 percent of their graduating high school class or are students who, on their first attempt, equal or exceed a cumulative Scholastic Aptitude Test (SAT) score of 1200, or a score of 27 on the American College Test (ACT). Scholarships are granted to students in families earning up to 135 percent of the state median family income—currently $85,900 annually for a family of four. Students in low-income families who qualify for state and federal grants for post-secondary education can also receive a Promise Scholarship. Legislative Session: Program established in state budget. 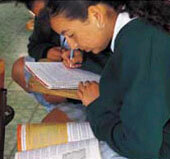 1999-2000 Academic Year: 2,207 scholarships awarded to students in the top 10% of their class. Scholarships valued at $1,225 annually. 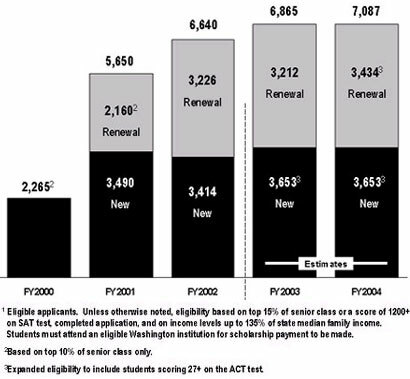 2000 Legislative Session: Program expanded to include students graduating in the top 15% of their class and those scoring 1200 or above on their first attempt at the SAT. 2000-2001 Academic Year: Award amount increased to $1,542, more than 90% of the cost of tuition at a Washington community college. 2002 Legislative Session: Legislature made program permanent in law.